This spicy Brexican is easy to cook and assemble so why not add that little bit of extra flavour to your weekend breakfast and get the kids involved. 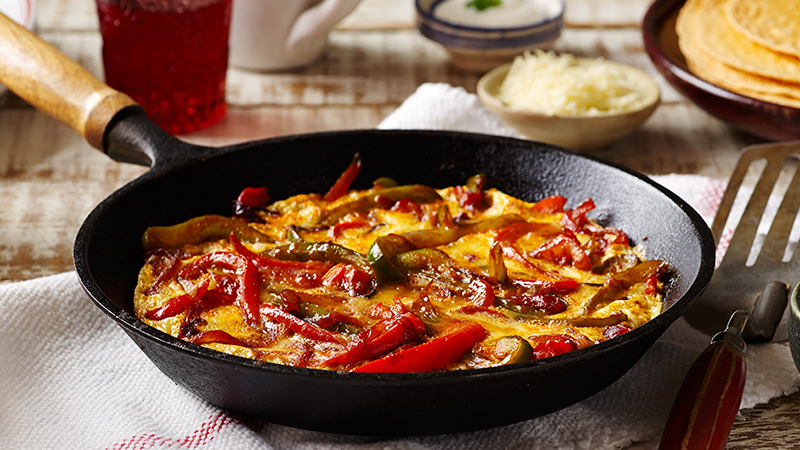 All you need are some veggies, some eggs and a packet of Old El Paso Roasted Tomato & Pepper Fajita Seasoning Mix. Enjoy! Add 2 tablespoons of olive oil to a large frying pan over a medium heat. Add the onions and pepper slices and cook until they start to soften, approx. 5 minutes. Tear open a packet of Old El Paso Roasted Tomato & Pepper Fajita Seasoning Mix and add the contents to the onions and peppers. Stir to coat the onions and peppers with the seasoning mix and cook for approx. 2 minutes. Turn up the heat and pour over the beaten eggs, ensuring they are evenly distributed. Cook for 2 minutes until the eggs start to set. Using oven gloves put the frying pan containing the omelette under a hot grill to finish (make sure your frying pan is suitable to place in the oven first). Cook for a further 2 minutes until the eggs start to bubble. Remove the frying pan from the oven and lay it on a heat resistant surface so you don’t burn your work surface or table top. Use a knife to cut up the omelette into portions, then using a fish slice, carefully lift each portion of the omelette from the frying pan and transfer to your plates. Grate over cheddar cheese, if you like. Tuck in!